Last time, I introduced the ryokan with hot spring and dinner of the Bungo beef in Yufuin. 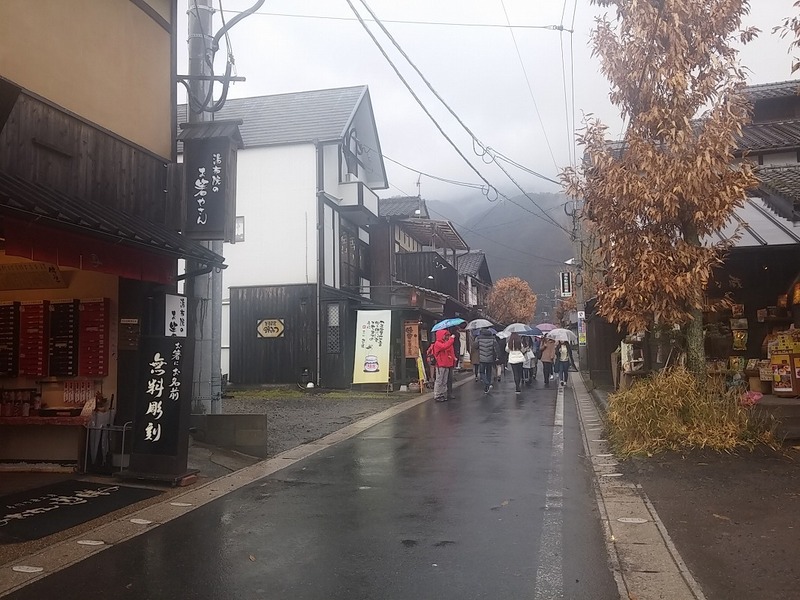 This time as part 2 of Yufuin trip, I am introducing tourist attraction of Yufuin. On the second day of the trip, the rain stopped a bit, so my friend and I strolled around in the town. First, we visited Yufuin station. There is a tourist information office at the station, and we can get a sightseeing map of the neighborhood for free. 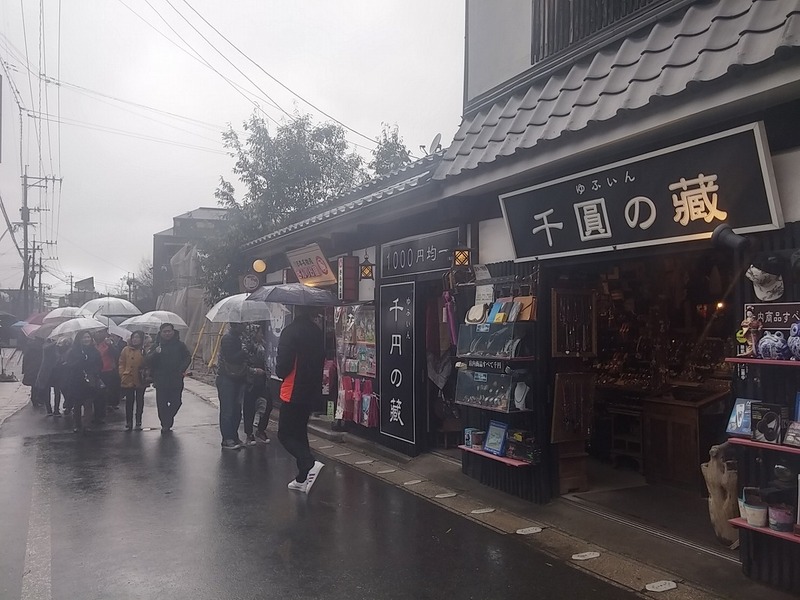 There are various shops such as souvenir shops or candy shops in the vicinity of the station and it was fun just walking around. 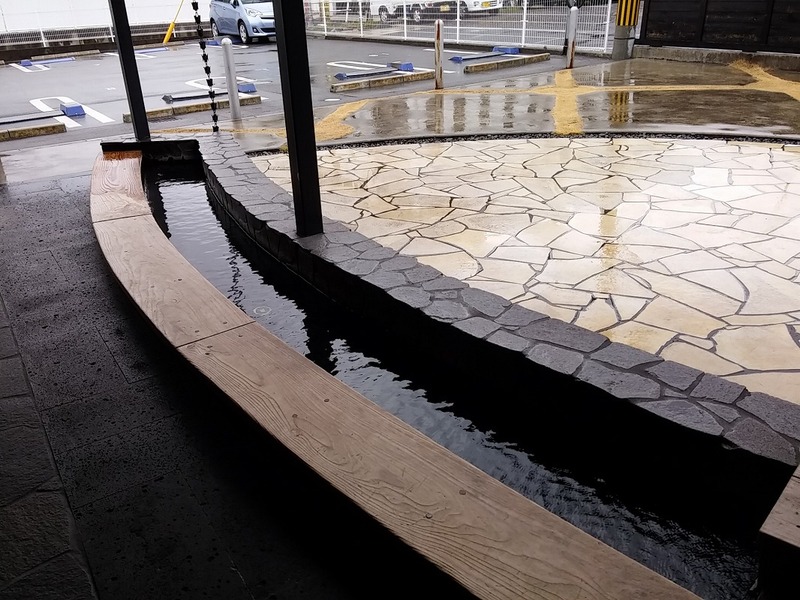 This is “Ashiyu 足湯 (foot bath)” at a souvenir shop (日乃新) in front of the station. 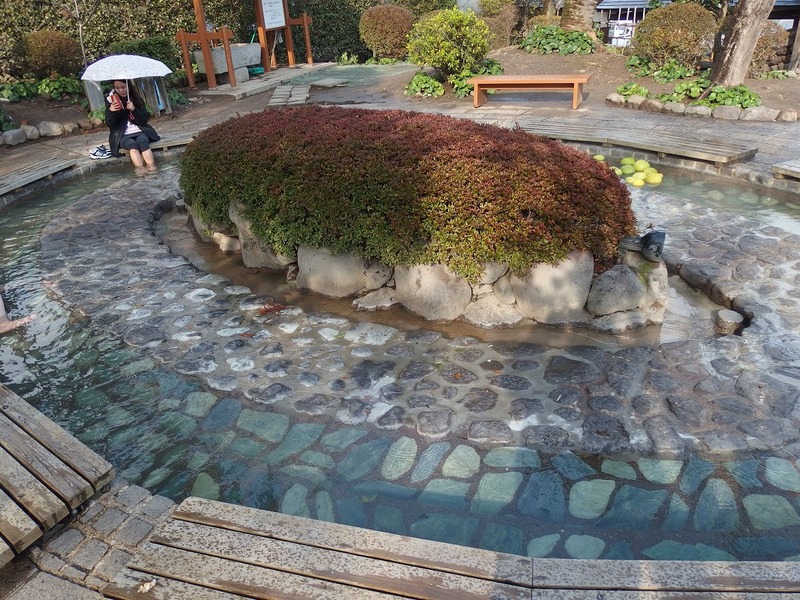 Ashiyu is a hot spring facility where you can bathe your feet. This foot bath can be used free of charge. 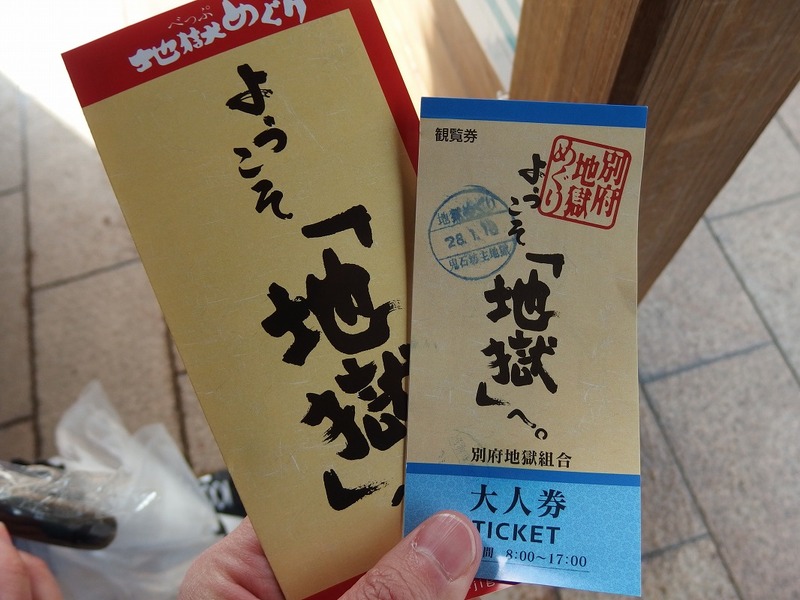 There is also a foot bath at the station and it has to buy a ticket for 160 yen (with a towel). 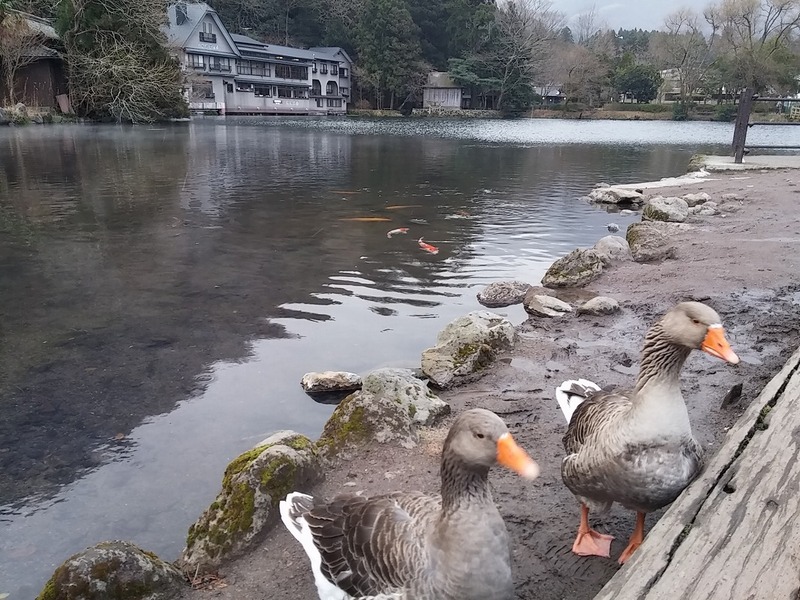 As is expected, Yufuin is a hot spring resort. 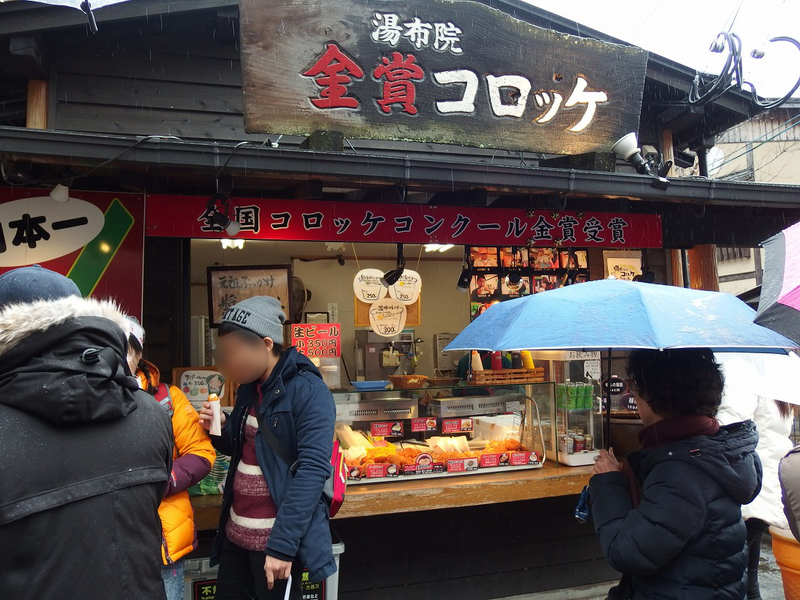 A croquette shop on the street of Yunotsubo-Kaido. Next, we visited the street called “Yunotsubo-kaido 湯の坪街道”. It is a distance of about 7 or 8 minutes walking from the station. 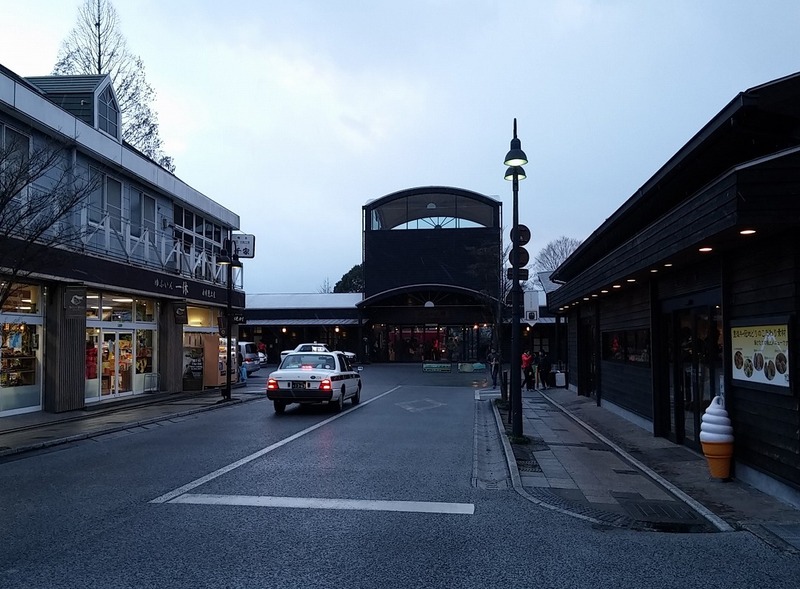 Many tourists visit this street because there are many shops such as souvenir shops, sweets shops, and restaurants. 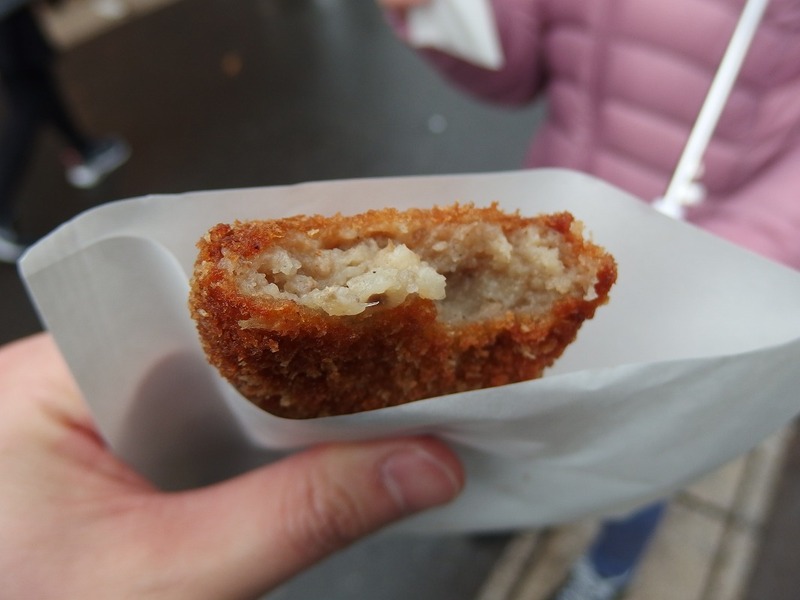 This is a second branch of the croquette shop “Kinsho-croquette 金賞コロッケ”. (There is also the main shop of Kinsho-croquette nearby.) This shop won the gold prize at the croquette competition nationwide. It is the very popular shop that I wanted to visit. It was crispy outside and the potato inside was creamy. It was really good. Around noon, we decided to have lunch near the station. 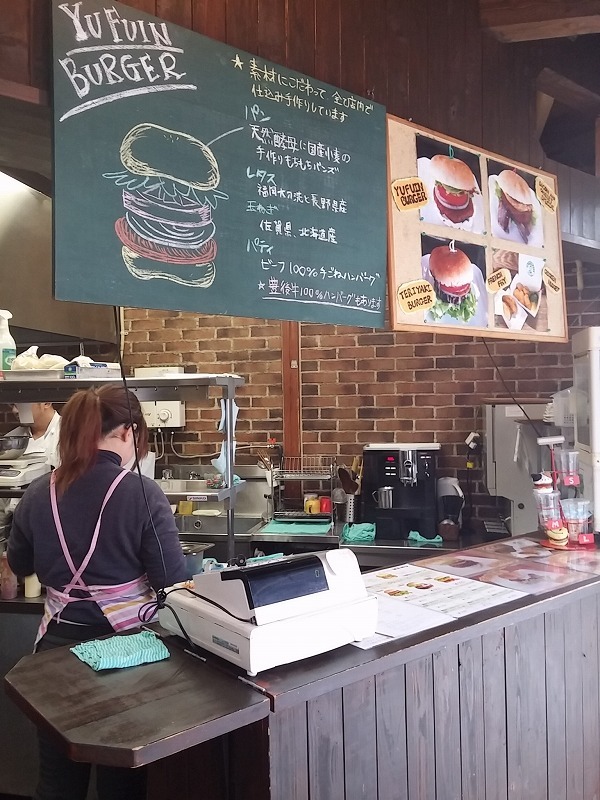 First, I got my eye on this burger shop “Yufuin Burger”. All homemade in the shop and the burger is made from Bungo beef. 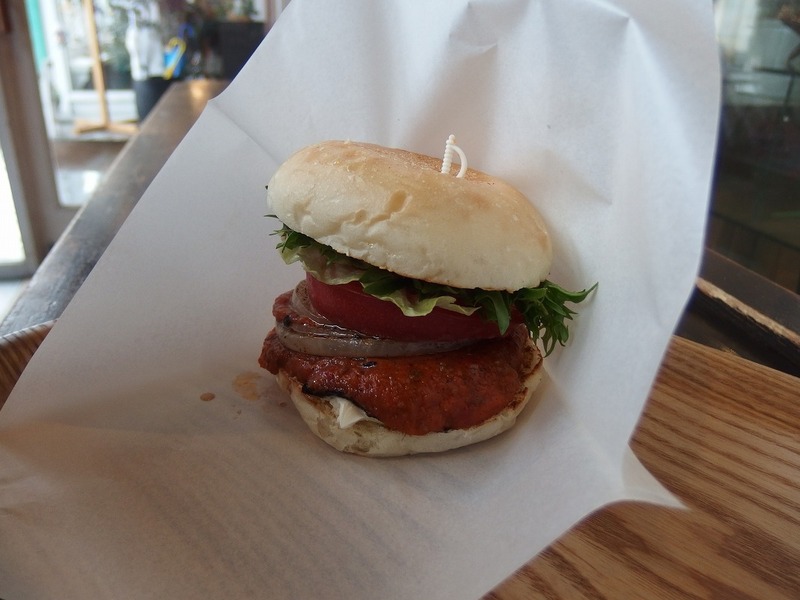 The burger with finely selected ingredients was delicious. The next we visited was “Yufumabushi-Shin 由布まぶし-心”. We can have Hitsumabushi that used Bungo beef at this restaurant. Hitsumabushi is originally a dish using the Kabayaki of eel (Kabayaki is one of Japanese cooking that broiled with a mixed source. And Japanese people often think “Kabayaki” means Kabayaki of eel). 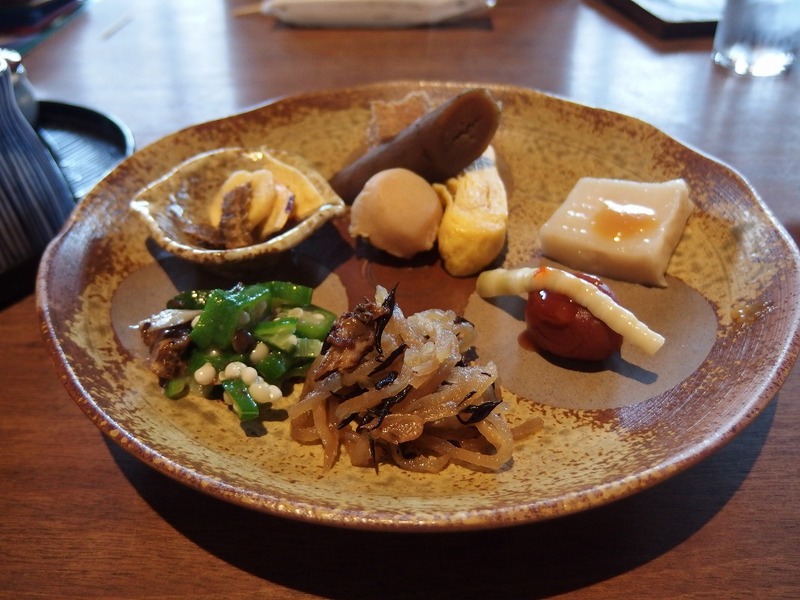 We can have three types of Hitsudmabushi used eel or chicken or Bungo beef here. I ordered Bungo beef of Hitsumabushi (2361 yen). Appetizer comes first. 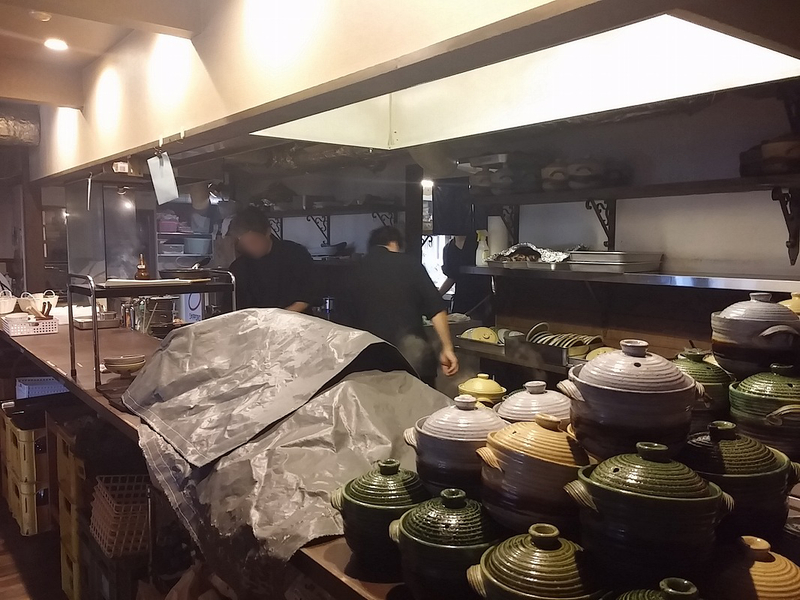 They cook one by one after a customer order, so it takes a little time to cook. This is Hitsumabushi of Bungo beef. and here is how to eat. For the first, mix the rice and beef in the bowl and dish out into a smaller bowl and eat as it is. 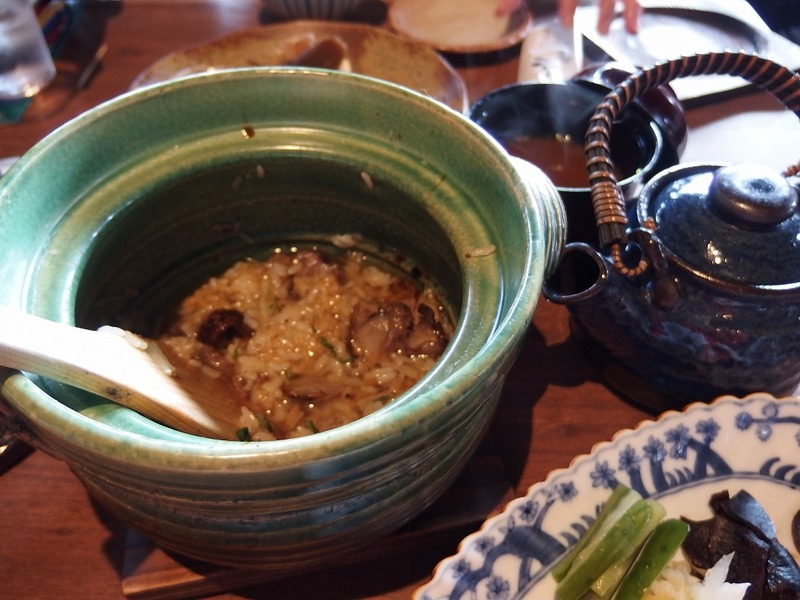 Then for the second, eat this mixed rice with those “Yakumi 薬味” in the photo below on the right side of dish or with some other condiments in the second photo below. And for the last, add some Dashi soup (broth) into a bowl and eat. That means you can enjoy three different tastes. 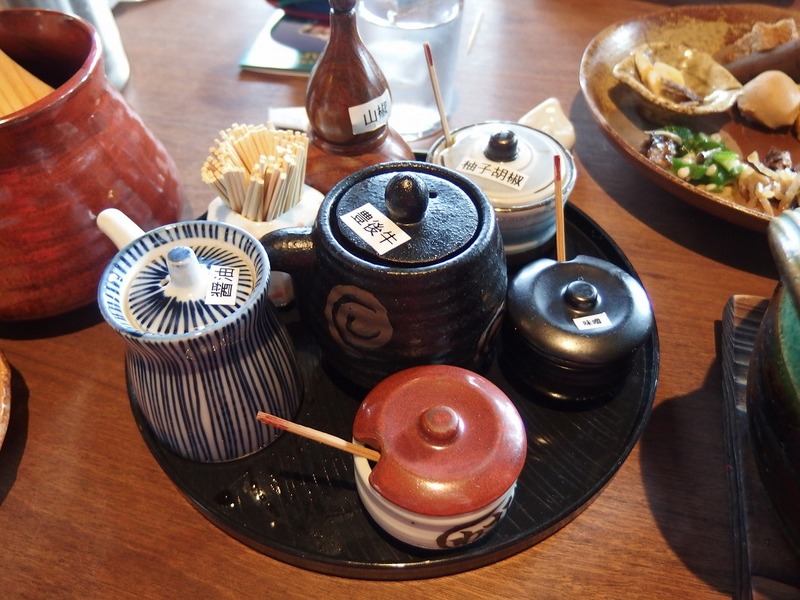 I feel like I’m just introducing something to eat, so let me introduce other sights in Yufuin. This is “Kinrinko 金鱗湖”. 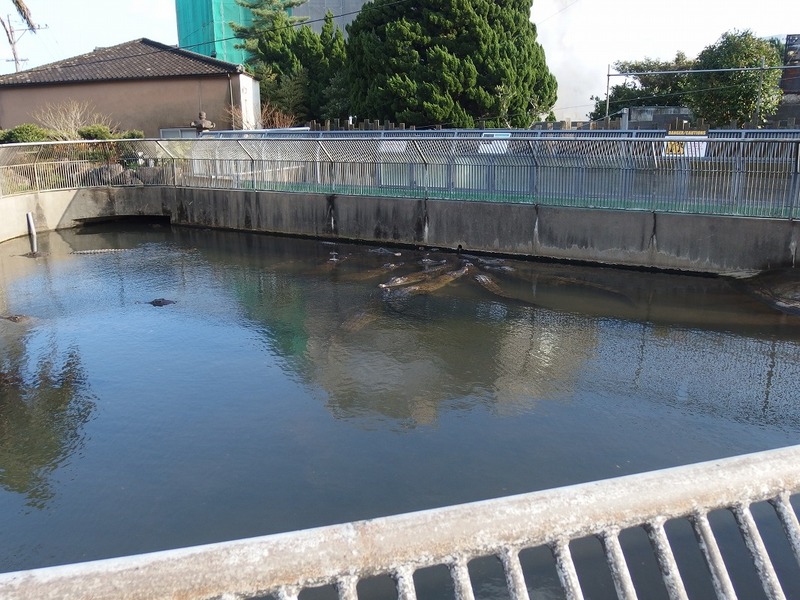 It is about 20 minutes on foot from Yufuin station. 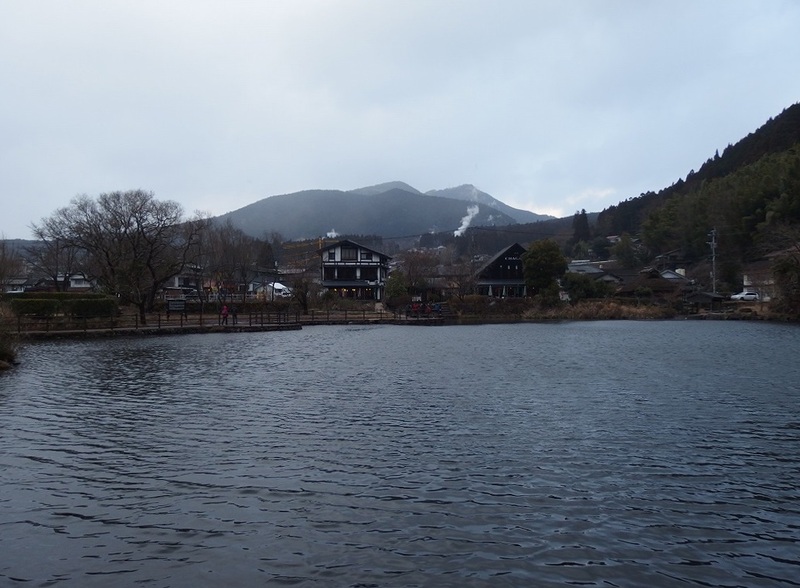 It is said that hot spring water is gushing from the bottom of the lake. 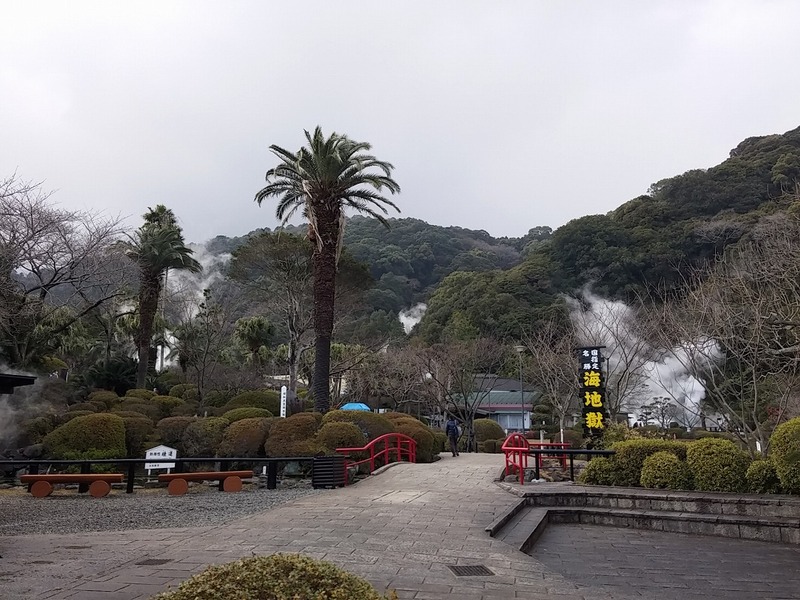 There is also hot spring water in one of the rivers flowing into the lake so you can see the morning mist rising from the lake surface from autumn to winter as the water temperature is high. This is “Sagiridai 狭霧台”. 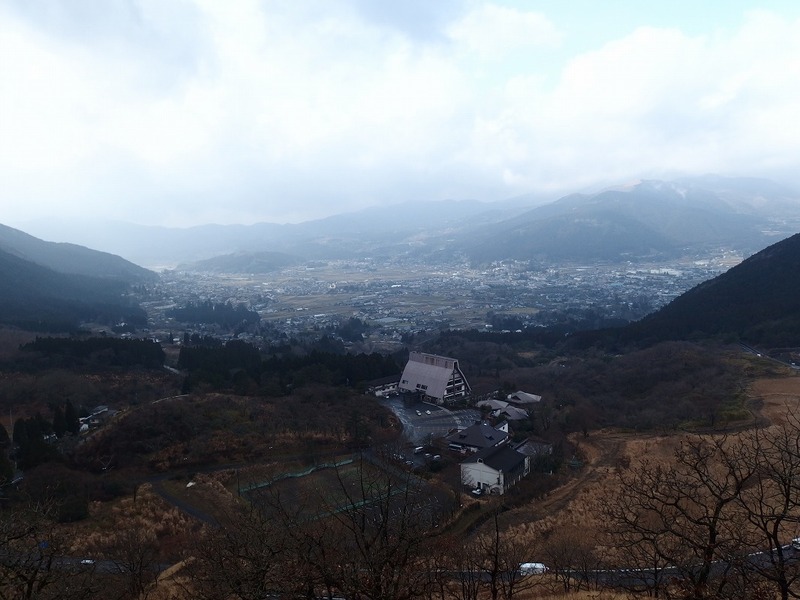 From here you can see the townscape of Yufuin. As well as Kinrinko, this place is also well known for seeing the fog hanging over the town in the morning of winter. Although it is necessary to come by your own wheel if you plan to go to Beppu through prefectural road No. 11, this place is along the road. There are still plenty of places for Yufuin, but we went to see “Jigoku Meguri (Hell Tour)” in Beppu city from the afternoon. 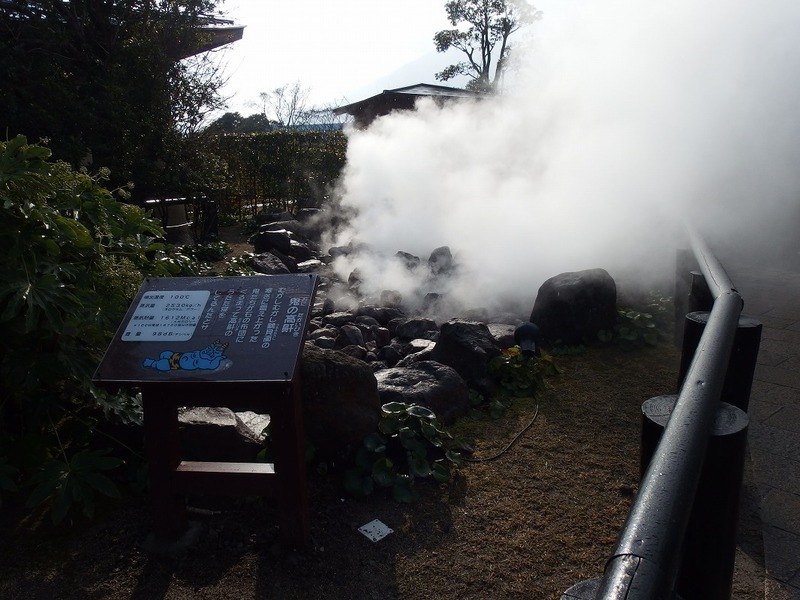 “Jigoku Meguri” is a tourist attraction that looks around the sources of hot springs. 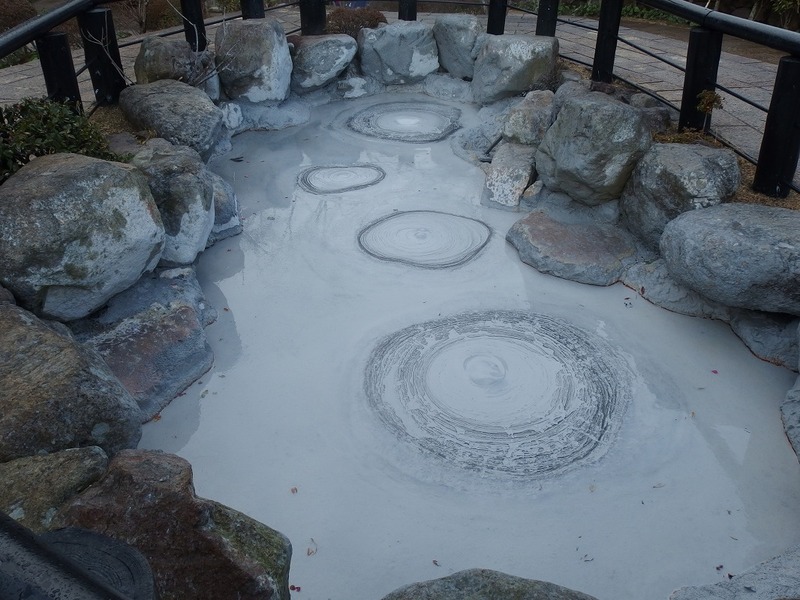 You can see the sources of hot springs with distinctive features such as a geyser or the sources that have different colors depending on the inclusion contained. 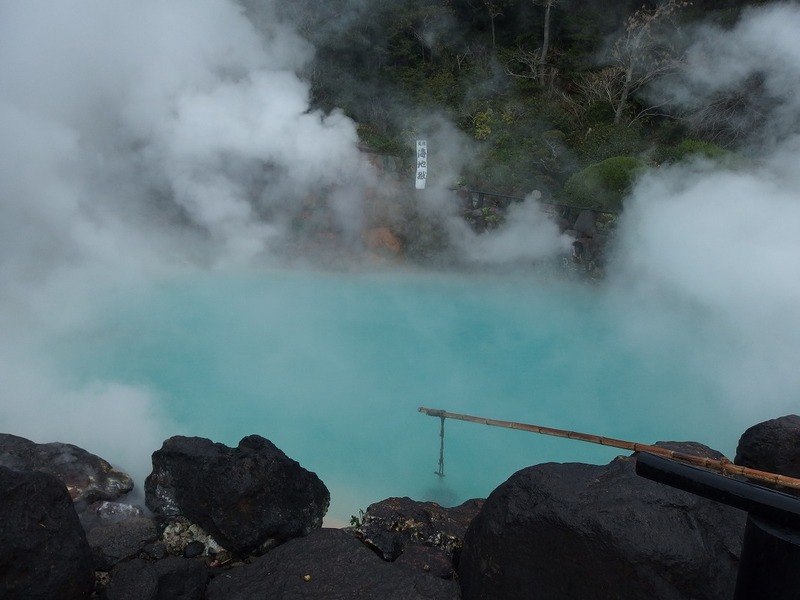 It is tourism resources unique to Beppu with the largest number of hot springs resources in Japan. Between Beppu and Yufuin, it was about 40 minutes by a rental car using a local road. It will be about 10 minutes faster if you use the expressway. You can move by bus, but you need to plan ahead as there are only 7 operations per day (as of June 2017). Take a tourist bus at Yufuin station and get off at the “Umijigokumae (海地獄前)” bus stop. I will put the link to a bus timetable here. 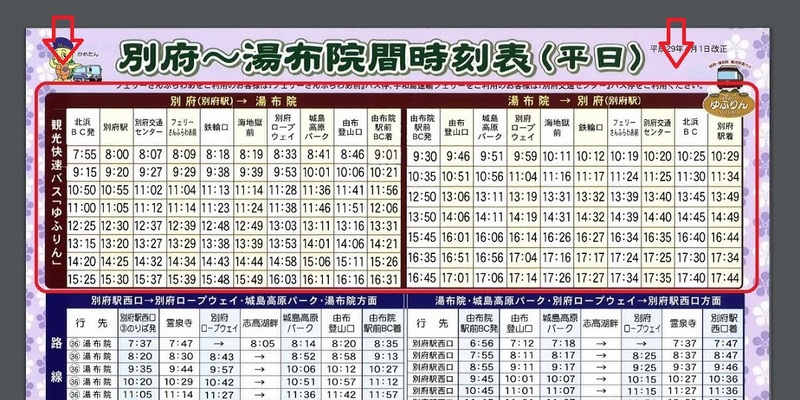 The red frame on the top of the link is the timetable for the tourist bus on the weekdays. The blue timetable below is a route bus. The second page of the link shows the timetable on Saturdays, Sundays, and public holidays. You can go to Beppu by the route bus, but you have to change the bus at Beppu station to visit Jigokumeguri. 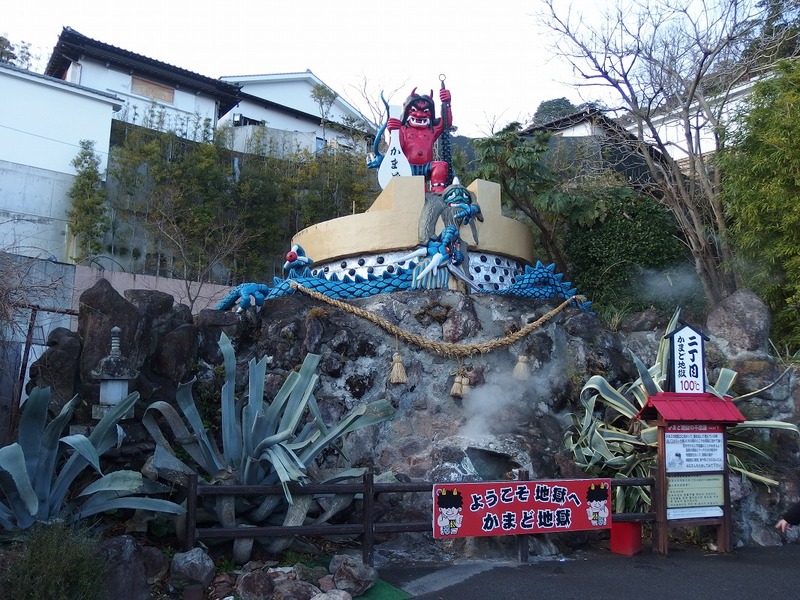 There are many “Jigoku” (hell) in Beppu, but the seven Jigoku that join the Beppu Jigoku Association will be the main ones. 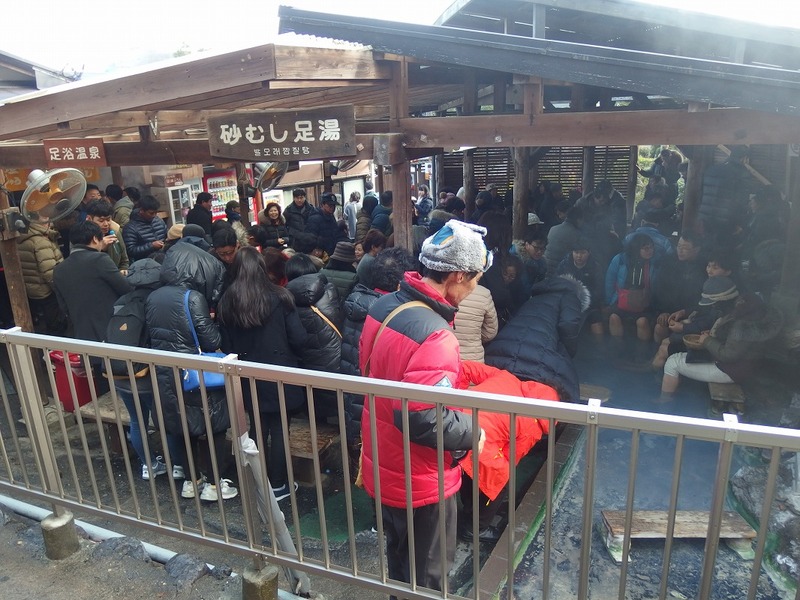 As the route of Jigoku Meguri, it is efficient if you go around in the order of Umi-Jigoku (海地獄), Oniishiboze-Jigoku (鬼石坊主地獄), Kamado-Jigoku (かまど地獄), Oniyama-Jigoku (鬼山地獄), Shiraike-Jigoku (白池地獄), Chinoike-Jigoku (血の池地獄), Tatsumaki-Jigoku (竜巻地獄). Two of Chinoike and Tatsumaki Jigoku are located at a little distance. I think it takes about 2 hours if you look around all. The fee for coupon tickets is 2,000 yen for 7 Jigoku (as of June 2017), and 400 yen per place if you don’t buy coupon tickets. Yama-Jigoku (山地獄) near the Umi-Jigoku has recently withdrawn from the Beppu Jigoku Association, so it is not included in the coupon tickets. I will show some of Jigoku this time. We also decided to start from Umi-Jigoku. This is Umi-Jigoku. The blue color of the pond is because of iron sulfate, which is a component in the hot spring is dissolved. 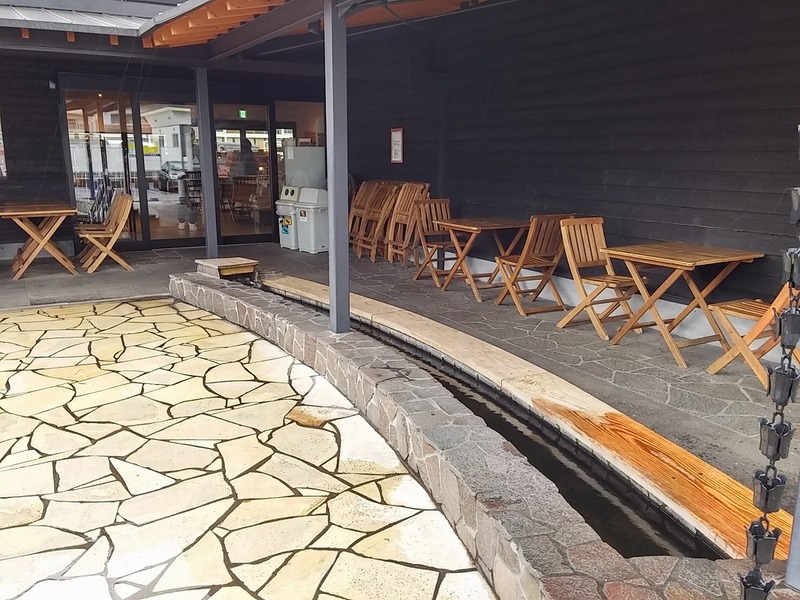 There are also Ashiyu (foot bath), a restaurant and a souvenir shop in this place. Especially the pudding in the souvenir shop seems to be quite a popular item. The next we visited was Oniishiboze-Jigoku next to Umi-Jigoku. It seems as if muddy water boils. There is also Ashiyu that is open to visitors for free. The next is Kamado-Jigoku. 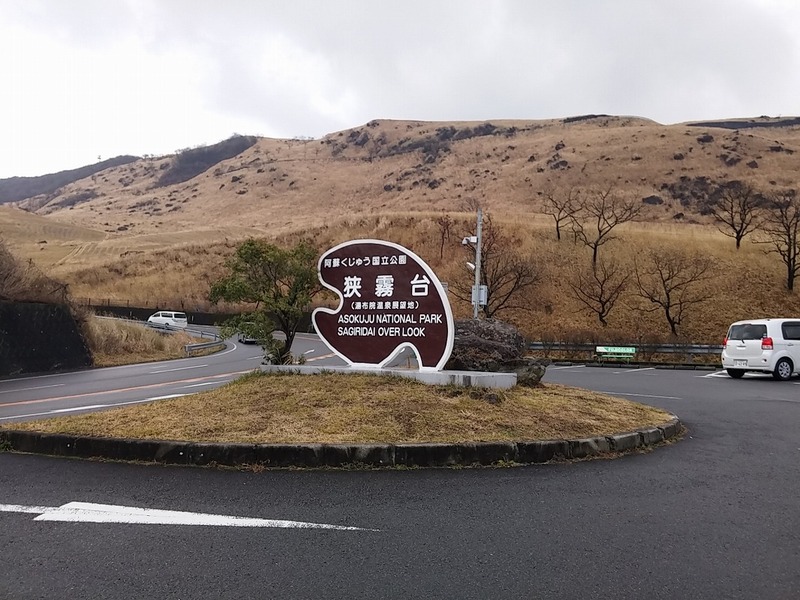 It is a distance of about 10 minutes on foot from Umi-Jigoku, but if you plan to visit Chinoike-Jigoku or Tatsumaki-Jigoku later then it is wiser to come by your own wheel. There is a free parking lot. Somehow very popular footbath. Visitors in the park can use it free of charge. The next we visited was Oniyama-Jigoku. It is called another name “Wani-Jigoku” in Japanese, that means crocodile hell. 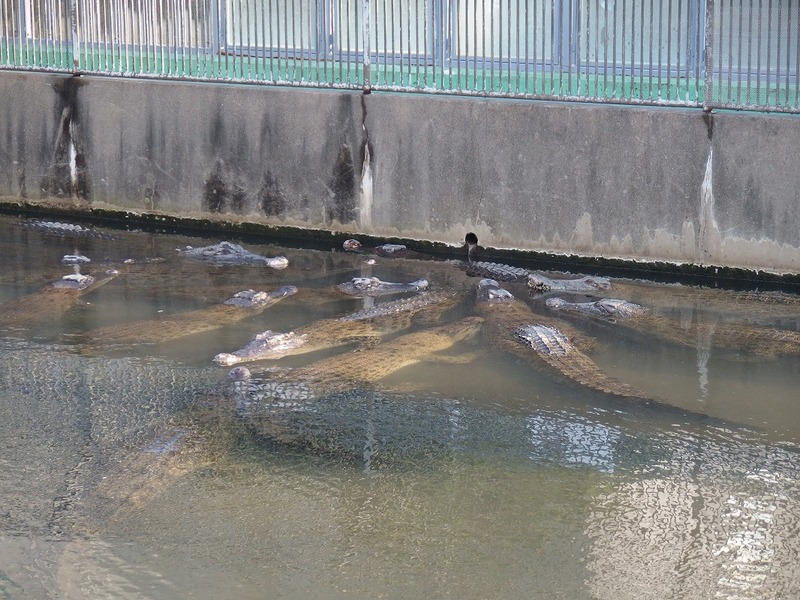 About 70 crocodiles are raised here using hot spring heat. 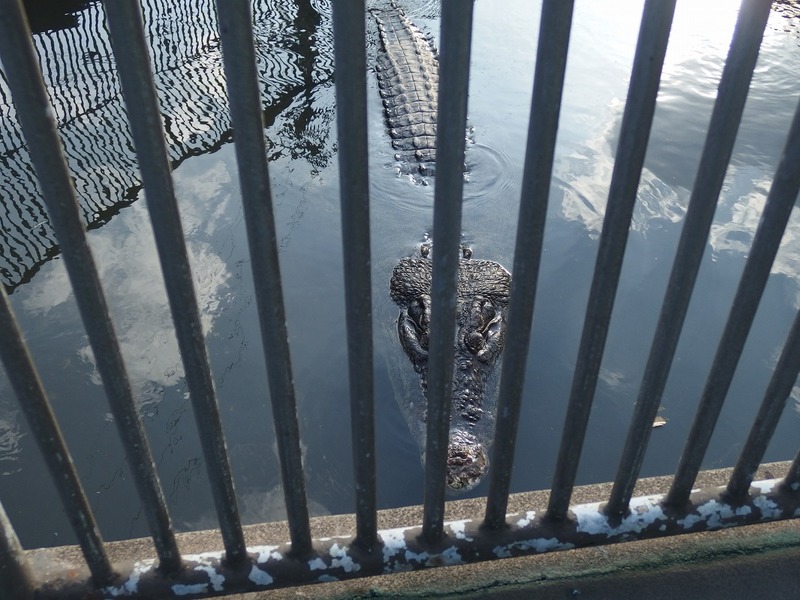 You can see the feeding of the crocodile at 10 o’clock every Wednesday, and 10 and 14:30 o’clock on Saturdays and Sundays. They don’t move much but I was nervous just by taking a picture nearby. We have visited five Jigoku in all, including Shiraike-Jigoku which I didn’t introduce this time. If you don’t have enough time and going to visit only a few Jigoku, you should purchase tickets separately for each Jigoku. The recommendation from those who visited all the Jigoku seems to be Umi-Jigoku and Chinoike-Jigoku. If you plan to visit more than 5 places, coupon tickets are better. The coupon tickets can be purchased at any Jigoku. Incidentally, Tatsumaki-Jigoku will eject about once every thirty minutes, so make sure you are visiting there right time. Access from Fukoka: You can take a limited express train or a bullet train from JR Hakata station, but using an express bus is cheaper. Others: Addresses of attoractions in Yufuin are on the map below. To Umi-Jigoku, take a bus No.2, 5, 24, 41 at the west gate of Beppu station and get off at Umi-Jigokumae bus stop (海地獄前) or Kannawa bus stop (鉄輪). 20 min. To Chinoike-Jigoku, take a bus No.26 and get off at Chinoike-Jigokumae bus stop. 40min. 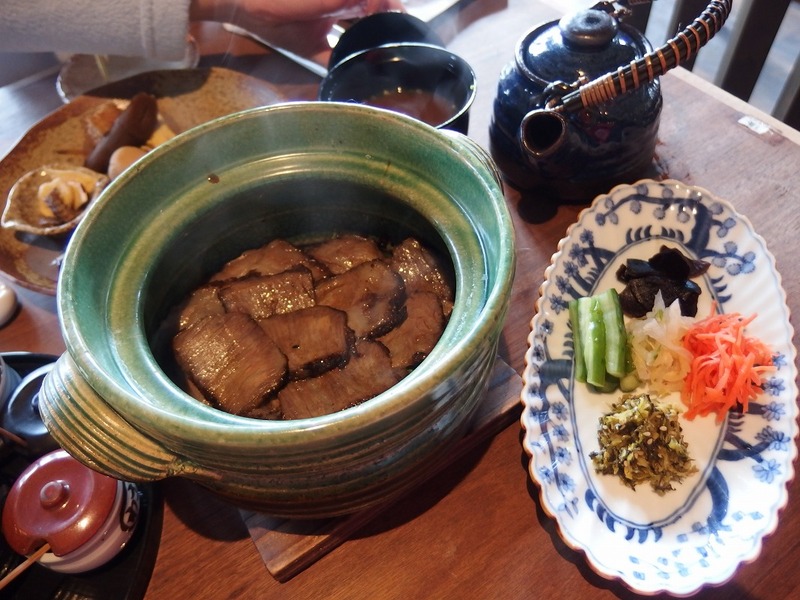 ← Oita Yufuin Trip Part.1: Relaxing At Ryokan With Hot Spring & Dinner For Bungo Beef.